Northern Property are delighted to offer to the sales market this Excellent Mid-Terrace property located on ever popular Iris Drive just off the Falls Road and Springfield Road in West Belfast. This area is popular due to its host of many local amenities including shops, schools, The Royal Victoria Hospital, the M1 Motorway and offers excellent commuter links to and from Belfast City Centre serviced by the new Belfast Glider Service. The property itself comprises of; hallway entrance to the Living room laid in laminate flooring with a bay window, feature fireplace and cornicing. Double oak doors lead to the open plan kitchen/dining room which offers a range of shaker style units complimented with ceramic wall and floor tiling. The back hallway offers storage, the rear exit and the access to the main shower room, ideally fitted with modern pvc panelling throughout. Upstairs this property hosts three good bedrooms and a floored roof space with fixed stair access. 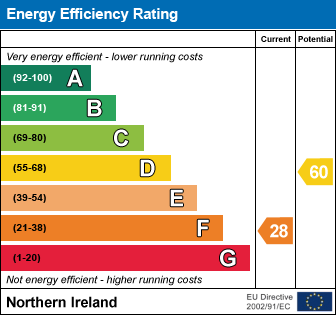 Further benefits include oil fired central heating and pvc double glazing throughout. I am interested in 85 Iris Drive, Belfast. Please contact me about this property.